Computer modeling tools such as ZBrush and Maya have made it easier to visualize whatever form that a human designer imagines. 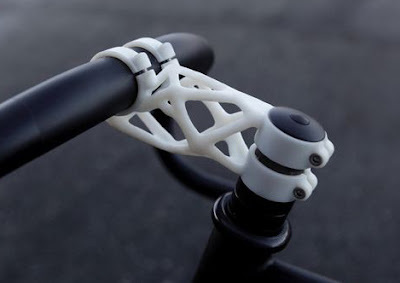 And 3D printing has made it possible to translate that design into physical form. We human designers, acting on our own intuition, tend to solve engineering problems with straight lines and simple geometric shapes, such as the object above, left. What if we let the computer be the designer? You can bring artificial intelligence and machine learning into the design process. All you give to the computer are the basic design goals and parameters, such as cargo capacity, strength, material type, cost constraints, and manufacturing method. The computer will take those parameters and come up with something radically different from what you imagined as the most elegant solution. The generative process yields dozens or even hundreds of options, and the human can select which one to produce. This new enterprise is variously called "deep-learning generative design," "intuitive AI design," and "algorithmic design." New plugins for Maya have already made such technology available. The designs generated by this process look like something out of Art Nouveau. They look biological, resembling skeletal architecture, with curving shapes. As with biological forms there are no straight lines and no right angles. There's no consideration of style. They're not made to look beautiful but rather to be efficient. 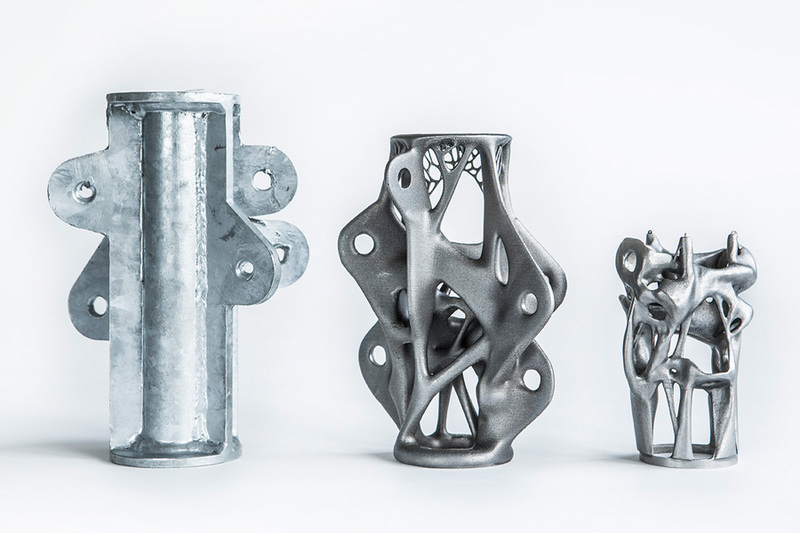 Generative designs are vastly lighter and stronger than human designs. The forms are often surprisingly complex, apparently more intricate than they need to be. They're not necessarily easy to produce without a 3D printer. 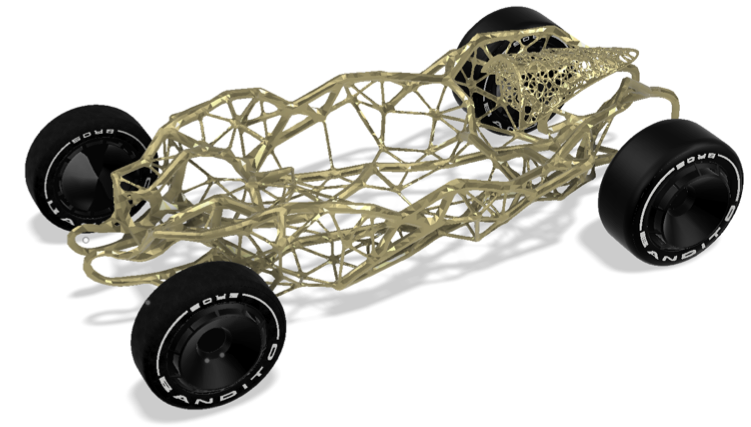 Automobile chassis, designed by generative design. But the process doesn't have to end there. By installing a lot of sensors into a working prototype, engineers can harvest data about stresses, wind resistance, and track speed, and input that information back into the computer's design algorithm. This allows the object to continue to evolve or "design itself" at a rapid pace through field-tested iterations. In this Ted talk, Maurice Conti introduces the concept, describes the process, and shows some outcomes. 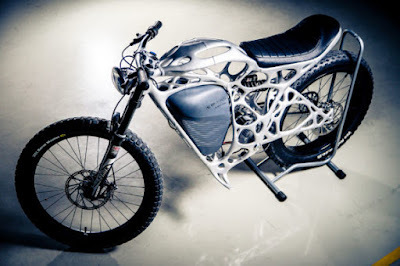 Medium essay: "The Alien Look of Deep-Learning Generative Design." Wow...this is going to change our perception of the manufactured world. As artists it'll be interesting to see how we handle these ideas/conceptions in perspective and conveying a sense of scale without rivets or other familiar visual cues. Which coincidentally Google is celebrating on their home page. I suppose the computer's come up with a design based on strength and lightness of weight. Interestingly, the examples shown are very similar in structure to the bones of a bird. If you search for 'bird bone structure', you'll see some remarkably similar results. Very interesting idea, but rather impractical at this point. I work as a mechanical designer and the main thing that rules after meeting design requirements (ie: strength) is cost of manufacture. Those boring and simple straight lines most often prove to be the cheapest to produce. The bean counters rule.